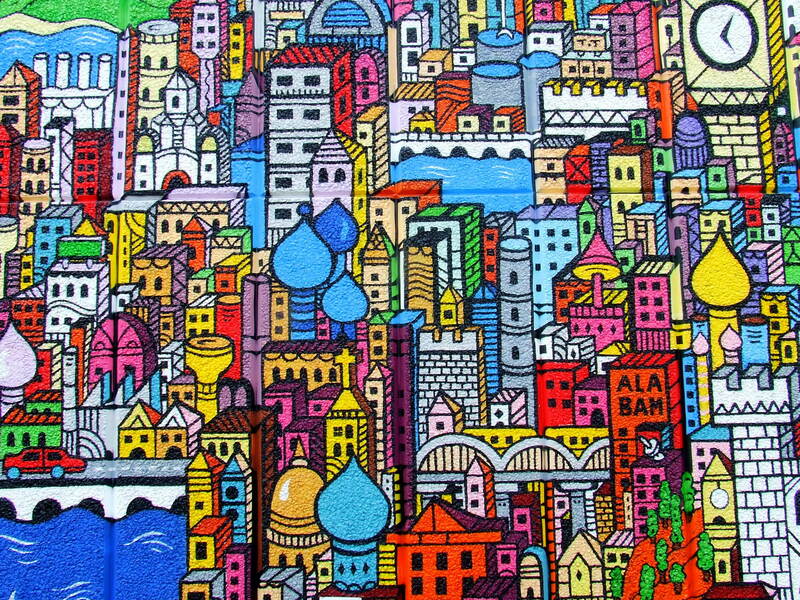 It is a statement of the obvious that art operates as a window onto culture. If some alien was trying to understand who we are, what motivates us, what we hold as important, they would only need to take a look at our creative output; our film/TV in particular. I love watching films made in other cultures- Chinese films for instance- all those heroic, stunningly shot epics of love, honour and discipline. They give me hope for mankind as China will surely hold the reigns of the coming Empire. 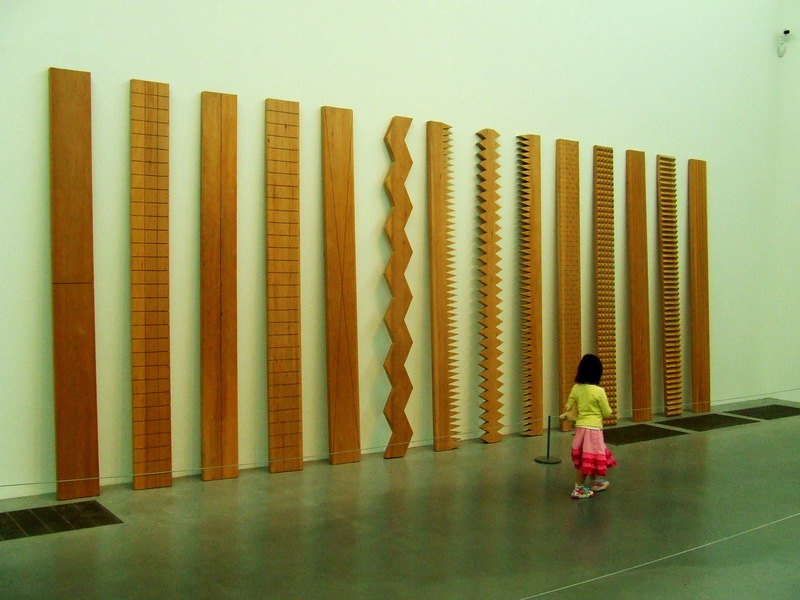 Our recent trip to the Tate Modern on the South Bank threw all this back into my mind. It was a riot of odd objects and ideas. The first challenge is always to find a way into the language that is being used- and this takes a lot of time for people who are unused to this kind of art. Many pieces I walked past, bemused. Some seemed too heavy handed- empty canvasses with a slash down the middle, boxes of wood with a hole in each end and light inside. It was possible to ‘get’ what they were doing, but move on quickly. Often I failed to understand why THIS object was thought worthy of a national gallery (a pile of melted plastic, a ‘cage’ made out of what looked like turds threaded on wire) but I was more than happy to engage with them anyway. Then there were all the Turners, Picassos, Hepworths and the like. These tended to be crowded about by a kind of repellant hushed awe. I found myself moving swiftly on, propelled by a combination of my own sense of inadequate knowledge and a discomfort with celebrity-art. What stood out for me were pieces that used language/symbolism that I already understood- they used cultural references that were familiar to me, but seeing them in a large gallery changed them, opened them up a little. Perhaps my favourite piece however was one called Active Poetry, by Polish conceptual artist Ewa Partum, back in the 1970’s. 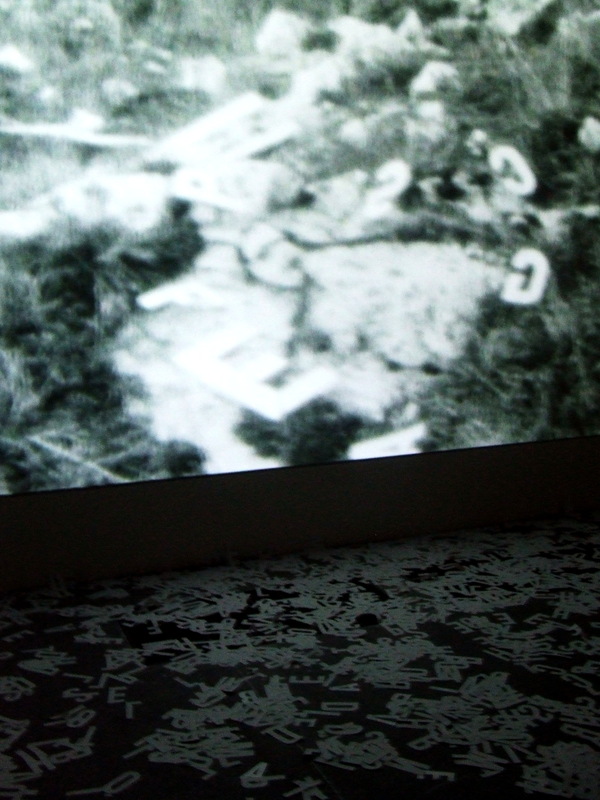 This was a dark room, with projected old 8mm film and a tumble of letters. Partum took parts of famous literary texts, cut them up into letters and scattered them in natural settings. She used typefaces of the kind often used for propaganda. In doing so she asks little questions about literature, history, nature, creativity. 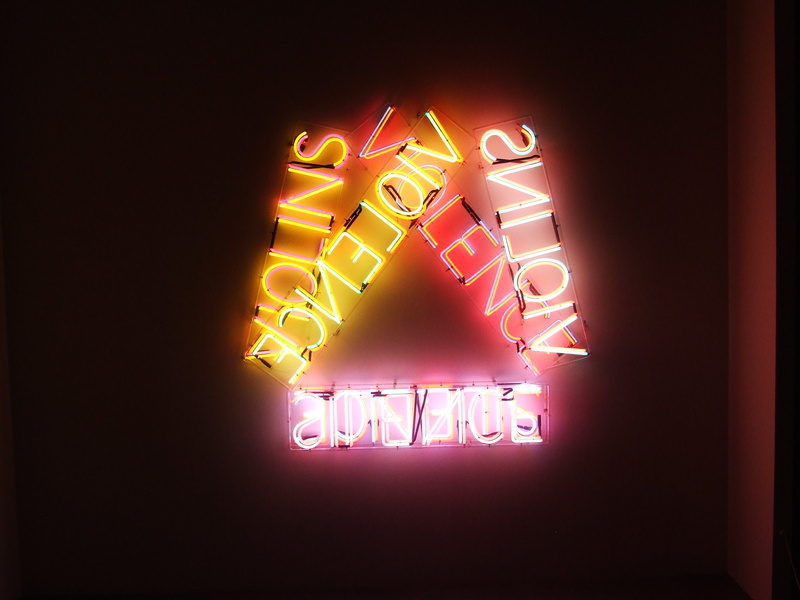 This entry was posted in Uncategorized and tagged Active Poetry, art, art and culture, Bruce Nauman, eva partum, modern art, Pablo Picasso, South Bank, Tate Modern by Chris Goan. Bookmark the permalink.